Air BnB may be the most popular vacation rental service in the world, but it can be a bit of a gamble as to whether you’re going to get the standard you’re expecting, and you’ll often be getting bare bones services and amenities. Let’s not even think about the soaring surcharges. We can’t speak for other cities, but in Jerusalem, there is a great selection of official vacation rentals run by professionals who guarantee the comfort of a hotel and the independence and privacy of your own home. In addition to a place to lay your head and cook your meals, many also offer extras like guaranteed parking, cribs for toddlers and on-demand service in the event you have an issue with your rental. Situated in between downtown Jerusalem and the popular Mahane Yehuda Market, Windows of Jerusalem 5-star luxury vacation rentals offer the perfect combination of top-notch hospitality and ideal location with a side of stunning city views. All Windows of Jerusalem apartments offer stunning city views and are fitted with modern, luxurious furnishings and amenities. They also have the option of a kosher kitchen, extra gear families with toddler, guaranteed paid parking and the buildings are equipped with Shabbat elevators. Apartments are available in sizes ranging from 1 to 4 bedrooms to accommodate all travelers from individuals to large families. The bars, restaurants, shopping and attractions of the shuk and the city center are each only a 5-minute walk from the property, and the Old City and Central Bus Station are only 10-15 minutes by foot. 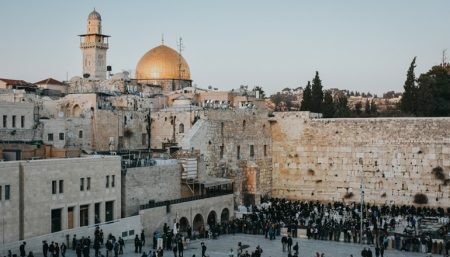 Meanwhile, you’re only a few steps from main public transportation routes that can take you all over the city, including Yad Vashem and Mount Herzl, the Old City and Mount Scopus within minutes. Housed in a historic 19th century building, The Templer Inn is an elegant all-suite hotel that will take you back in time and invite you a true and authentic Jerusalem hospitality experience. Located at the heart of the German Colony neighborhood in Jerusalem, the hotel is just a few steps away from the city’s most popular cultural centers, such as The First Station, Chan Theater and Emek Refaim Street with its boutique stores and cafes. The Templer Inn offers four comfortable suites with a spacious bedroom with a twin bed and a living room with an unfolding sofa bed in case you’re travelling with children or with friends. In addition, the suites include a convenient kitchenette where you’ll be able to cook meals and enjoy a true domestic environment. The place also has a beautiful courtyard where rich country-style breakfasts are offered daily. If you’re interested in staying where it all happens in Jerusalem, then we recommend checking Jaffa 35 Apartments. The apartments are located on Jaffa Street – Jerusalem’s main street. You’ll enjoy perfect location and proximity to all the city’s major attractions, such as the Old City and Machane Yehuda Market. You’ll find two types of apartments: a one-bedroom apartment for up to 4 people and a studio apartment for up to 2. The apartments are spacious, air-conditioned and full of natural light. There’s a fully-equipped kitchenette with a refrigerator for your convenience, and all other necessary amenities, such as a TV set, free Wi-Fi, and everything you need to make you feel at home. Looking for a more of a country-side experience? Meal Ha Ma’ayan B&B is a beautiful Arab stone house located in the picturesque village of Ein Karem. The location is perfect for those who are looking to combine a romantic getaway with a great tourist destination. The guest unit includes a large studio with a bedroom niche, a kitchen, a dining area, and of course, your own private terrace. Just imagine having your coffee and breakfast in the morning while enjoying Jerusalem’s fresh and breathtaking mountains. In addition to all of that, Ein Karem is filled with historical places, restaurants, galleries, boutiques, hiking routes, and more. All in all, this is the perfect place for a proper rural experience. Part of the Little House hotel chain in Jerusalem, Little House in Rechavia is a beautiful boutique guesthouse located in one of Jerusalem’s most central neighborhoods. Besides its proximity to the city center (5 minutes walk), Rechavia neighborhood in itself is a great tourist destination when visiting Jerusalem. The area is filled with historic landmarks, official residencies, museums, art galleries, cafes, and more. Surrounded by trees and flowers, the hotel is situated in a renovated 76-year-old stone house, offering its guests an authentic and homely experience. The hotel has 28 family units and rooms, a variety of comfortable lounges and seating areas, roof terrace, a beautiful garden, and of course, a proper and delicious kosher Israeli breakfast. These one-of-a-kind vacation rentals in the heart of Jerusalem’s bustling Nahlaot neighborhood are just a stone’s throw away from the famous Mahane Yehuda Market and offer a truly authentic Jerusalem experience. Each apartment is fully furnished with modern, custom made furniture and has a fully equipped kitchen and a private balcony, and in case you don’t feel like cooking for yourself, the property provides breakfast and catering services. The city center and Old City are just 10-15 minutes by foot from the Market Courtyard, and there is a light rail stop practically right outside the door, giving you easy access to public transportation that can take you to some of the city’s top attractions in just a few minutes. Home to the iconic King David Hotel, King David Street is synonymous with luxury in Jerusalem. King David 23 Apartments offers fully equipped short-term vacation rentals in one of the many upscale apartment complexes near the bottom of the street, just a few minutes walk from the Old City, Mamilla Mall and the city center.